Welcome Welcome Welcome to our FIRST Bits of Splendor Monday! I am on overload at the moment and feel like I could explode with all sorts of ramblings from my heart. But for now I will simply say, I am so glad you are here. I am honored to be a part of your day. Your time. I know it is precious. And please know I love that I am able to be. I love that these words on a screen reach people across states. I would love to meet every one of you. I would love to hug you and sit and talk with you and learn about you and your little bits of life. The things that make you happy, make your heart skip beats. The things that you want do, your goals and your dreams. I love to know these things about people. I think in another life, I would have loved to be an interviewer of some sort because people fascinate me and questions for them flood my mind constantly. There are no rules. 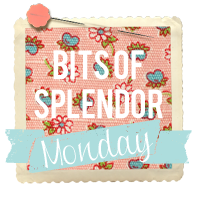 Just include the "Bits of Splendor Monday" button in your post so that others know where to find us. Please remember to link to your specific post and not your blogs main page. And then I hope you will click over to some of the other blogs and make some new friends. I plan to read each one and will highlight a couple next week! I am continually blessed by your genuine heart for people and beauty! You are amazing! Love this Laura, thank you. Happy Monday. I just discovered your blog today through the link up, and I'm SO excited to be a new follower! I can tell you have such a great heart and I can't wait to read more! I love reading your blog Laura. There is such sweetness and truth. Thank you for the link up opportunity. Wish we could meet also. Hope you have a wonderful week. what a great idea! so glad i found you:) see you here next monday!